A big thing I enjoy about blogging is the chance to learn about things. The way that most of these blog posts begin is that Carol and I are somewhere and take a lot of photos. Sometimes this is with the idea that we will write about it, sometimes not. Then we download the photos and look at them. Sometimes one of us thinks there is a post within them. So we start selecting the photos to use, and start to think about what I will write. Often the photos are of something I do not know much about. So in order to post more than just pretty pictures, I have to learn about what it was that we photographed, so I can provide a context to help the reader understand the post. I have learned to use the Internet for research, and found that often, by looking at images that come up through “image search,” and seeing something that I have photographed, and then drilling down into the web page that contains the image, I can discover things I can’t find from text searches. Sometimes what I am learning connects with other things I know, and a much biggest view comes. These are enjoyable moments. I had such a personal discovery process recently that started as I wrote first the post about Tonala and continuing through the post about Guadalajara’s Centro Historico. 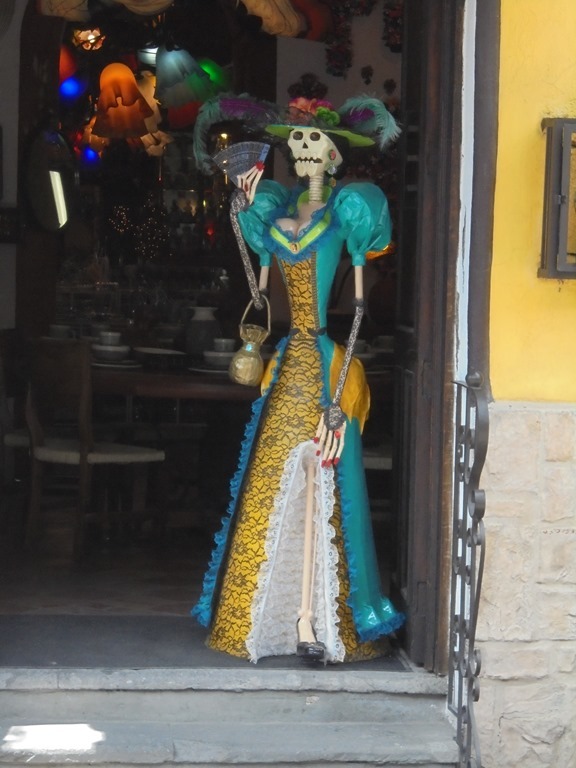 This post is about a popular Mexican figure, La Catrina, who is generally shown as a well-dressed skeleton wearing a wide brimmed fancy hat. 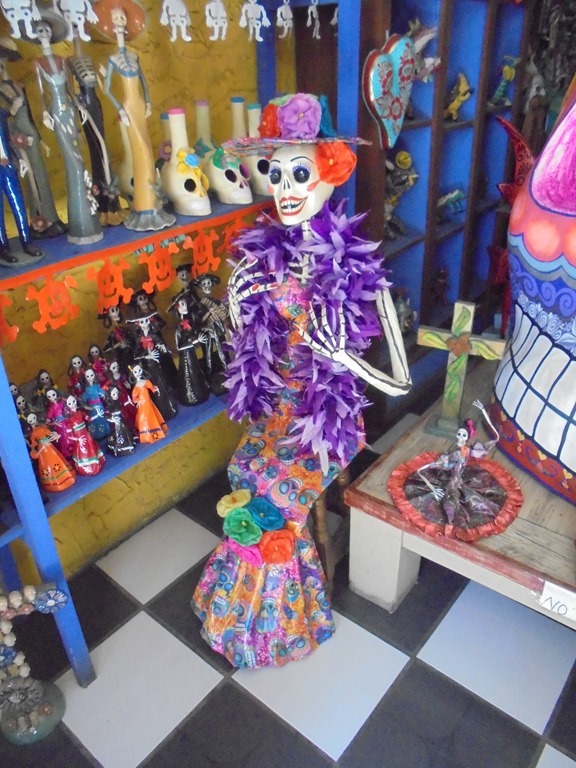 Here is La Catrina as I first saw her in Tonala. Only I didn’t know who she was. I thought that this was some kind of “Day of the Dead” decoration. I knew that Day of the Dead is a big deal in Mexico. I wrote the Tonala post from a naive point of view, and so I did not do any of the research for that article that I usually I do. When the Tonala post was published there was criticism from readers about the lack of background information I gave on these skeletons. When I started work on the Guadalajara Centro Historico post I had in mind to do a well-researched piece. I took some photos of skulls, and intended to write about the tradition and explain these skulls as an item of popular culture. Then as I was researching about the first place we saw in Centro, Plaza de las Nueve Esquinas, “The Plaza of the Nine Corners,” I came upon a song about the place that had this line: “Donde correteó la loba/A toditas las catrinas…” When we tried to get an on-line translation, the word “catrina” was never translated. (Some of the other translations, by the way, were hilariously wrong.) Catrina was some kind of idiom, I thought, and these don’t translate well. I asked Carol about it. She knows some Spanish, and is working on learning more. She said she’d look at a better translation for the blog entry. I put this out of my mind for now. 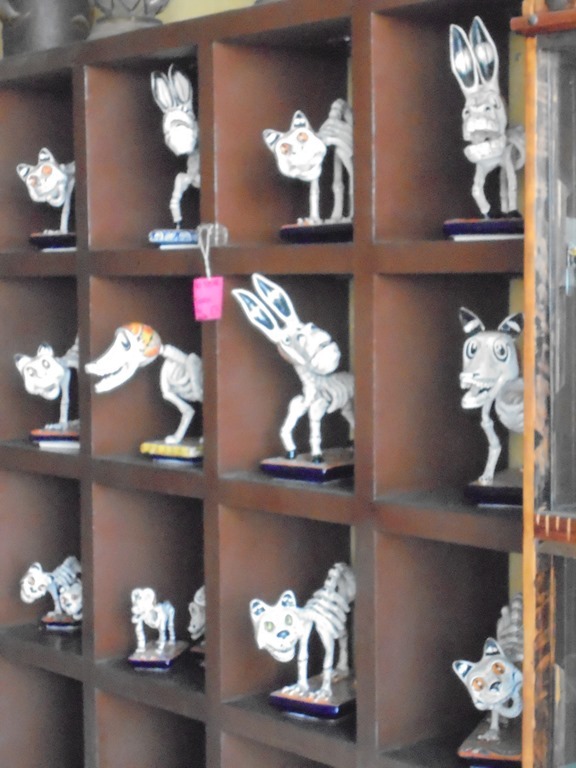 Then when I got further into the post, in the Mercado Libertad section, there was this photo of skulls. So I started researching. First I looked up Day of the Dead and found articles about the sugar skull tradition. In one article I found the Spanish word, Calavera, and I looked it up. It means “Skull, or sugar skull, usually used for Day of the Dead,” El Dia de Los Muertos. They have been made like this since the 17th century. 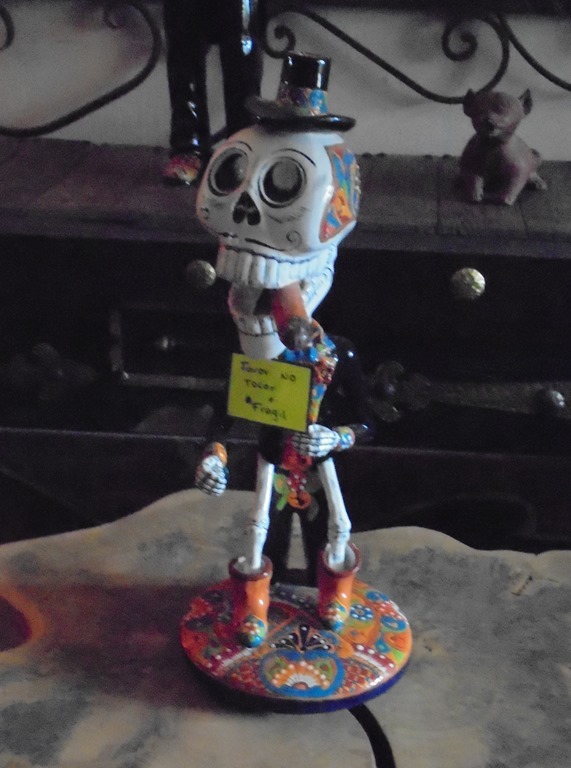 They are created for children and as offerings for the altars of El Dia de Los Muertos. They are usually made with cane sugar and decorated with tin foil, colored icing, beads, clay, feathers, etc. When they are put on altars they usually have the name of the dead loved one that is being commemorated across the forehead. 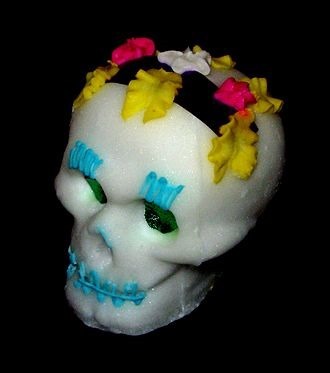 Below is a calavera, a sugar skull. Image from Wikipedia. Starting to have some success, I dug deeper. From the calavera page on Wikipedia I found and followed a link to calaca. 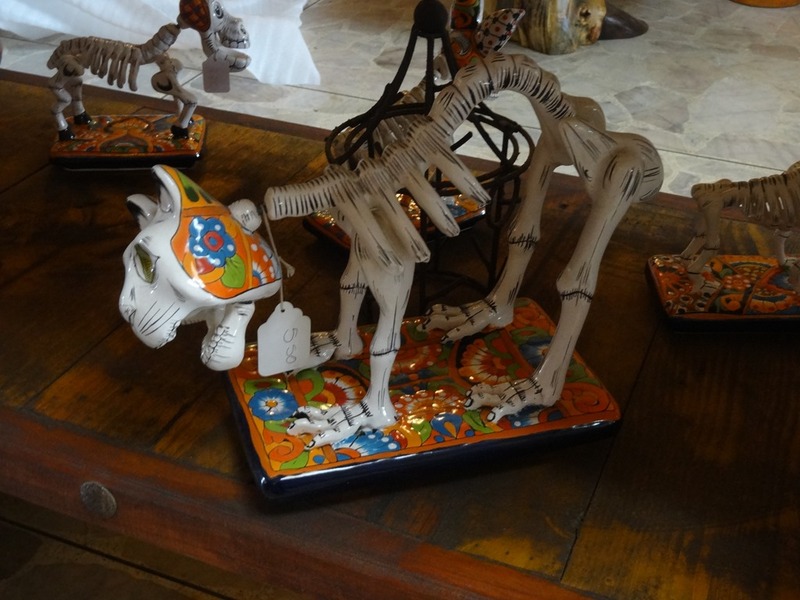 A calaca is a colloquial Mexican Spanish name for skeleton (or skull). 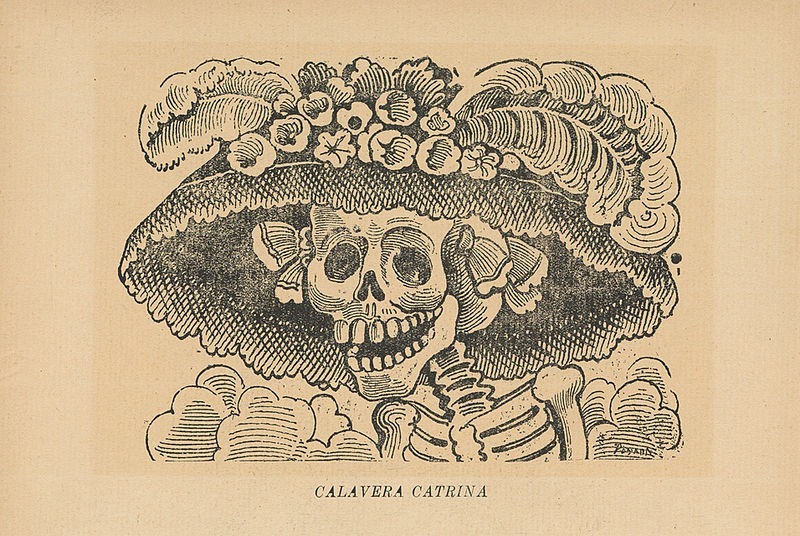 On this page there was this image, identified as “A calaca of Catrina.” Is this Catrina from the song? Calaca is the general Mexican colloquial term for skeleton. 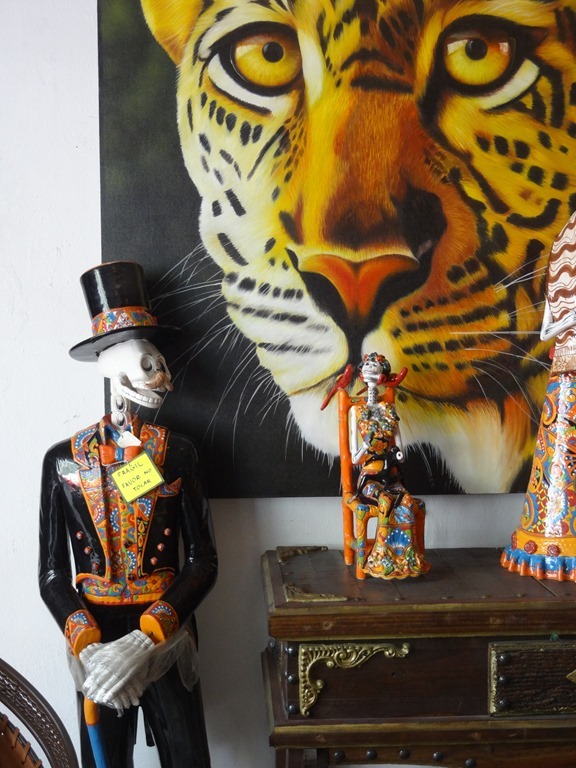 The Calavera (sugar skull for Day of the Dead) and Catrina (fancy dressed female skeleton) are specific forms of calaca, as are skull masks and small skeletal figurines. Tracing their origins from Aztec imagery, calacas are frequently shown with marigold flowers and foliage. As with other aspects of the Day of the Dead festival, calacas are generally depicted as joyous rather than mournful figures. They are often shown wearing festive clothing, dancing, and playing musical instruments to indicate a happy afterlife. This draws on the Mexican belief that no dead soul likes to be thought of sadly, and that death should be a joyous occasion. This goes back to Aztec beliefs, one of the few traditions to remain after the Spanish conquest. 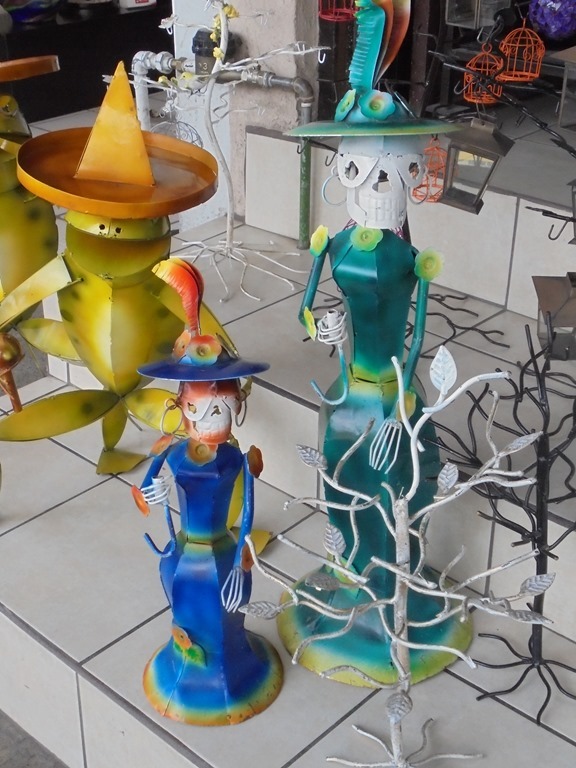 Here are several calacas we photographed in Tonala. 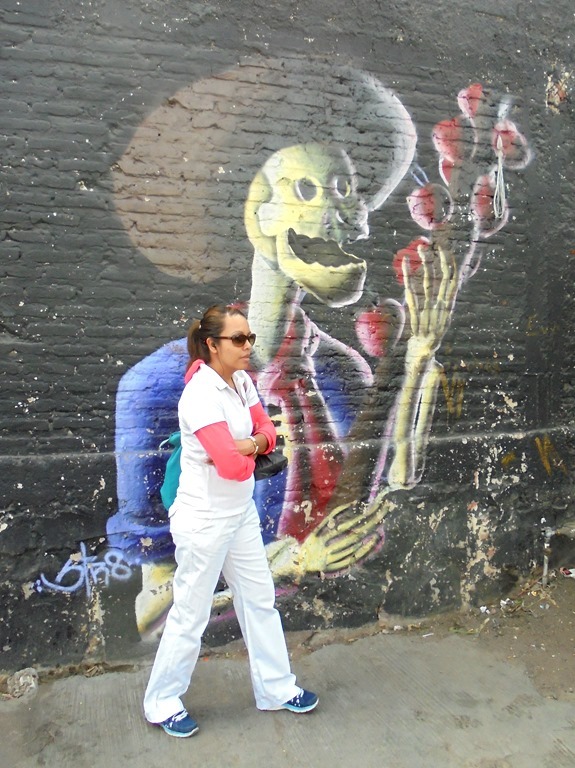 Below, a calaca painted on a wall. Since “Catrina” is definitely a female figure, I wonder if there is an equivalent word for a male calaca? 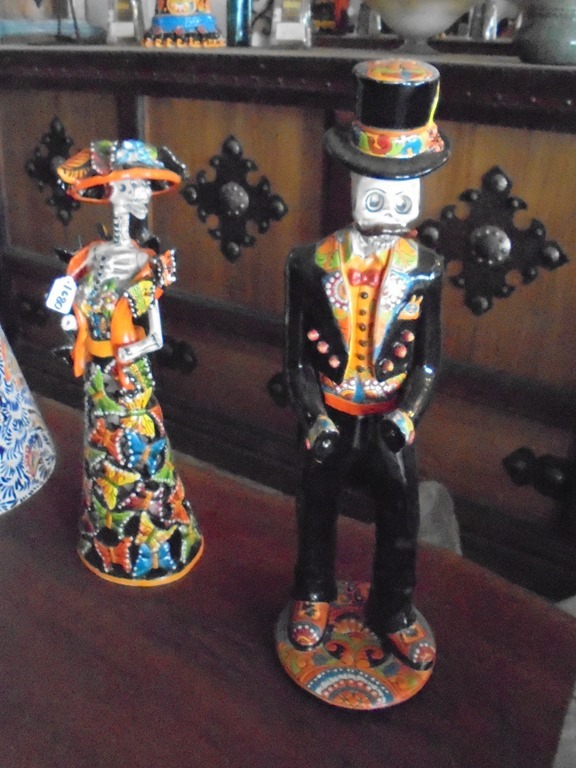 Painted ceramic Catrina and male companion. 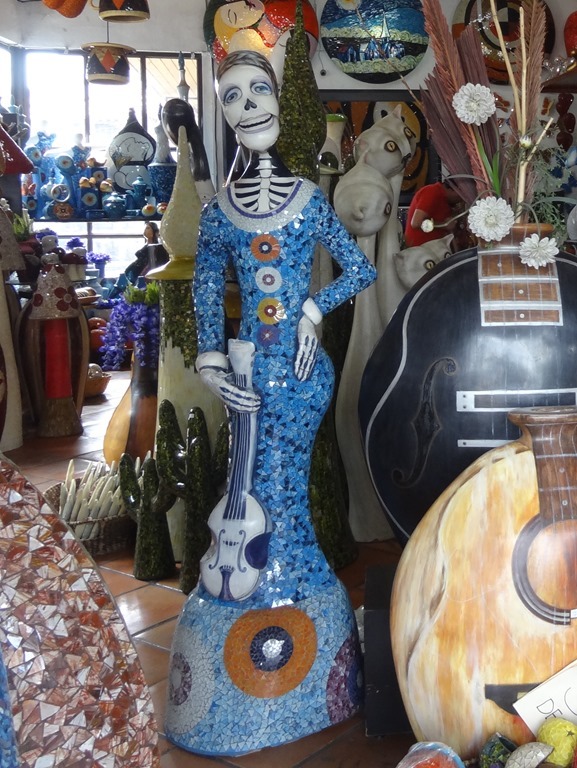 Catrina with a guitar, painted paper mache. Male calaca, smoking a cigar. Catrina, the fine lady. I think paper mache. I guess this is Catrina’s kitty. I like these skeleton figures standing below the giant tiger. Giant skull. About 5 feet high. It has a certain presence. Towards the end of our walk through Tonala we found a long wall filled with a painted tile rendition of painting. This is an interesting piece, and it completes the story of the evolution of La Catrina. 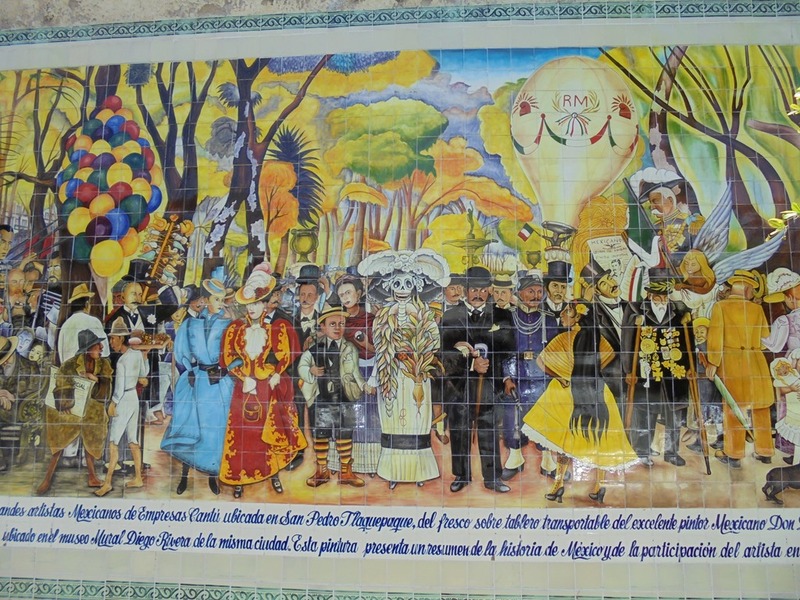 This is a painted tile version of the famous painting by Diego Rivera, Dream of a Sunday Afternoon in Alameda. In the center is the calavera of Jose Guadalupe Posada that originally just wore a hat. Now, in addition to the broad brimmed hat, fully dressed in a contemporary-style fine dress. This is the first appearance of La Catrina. Until now she had been known as La Calavera Garbancera. 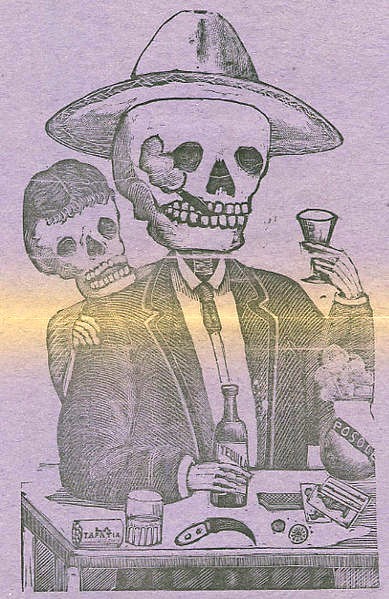 The history of La Catrina starts in the mid 1800s during the presidency of Benito Juarez, which began in 1858. Mexico had political instability from its beginning, after its War of Independence from Spain which ended in 1821. No stable government could be formed after independence from Spain. There were a continuing series of revolutions and reforms from the 1821 to 1875. From 1876 to 1915 Mexico was essentially a dictatorship headed by Porfirio Díaz, president. In 1915 he was toppled by the revolution led by the northern revolutionary general Pancho Villa and southern peasant leader Emiliano Zapata. There was a big difference between the lives of “the people” and “the privileged classes.” There arose “combat newspapers,” political publications accompanied by drawings of skulls and skeletons that derisively criticized the country’s situation and the privileged elite. Derisive, mocking artwork and political images were essentially a part of the popular public commentary that led to the revolution. The revolutionaries fought those in power by making fun of them. The earliest example of this I can find is a print by Manuel Manilla, a cartoonist Mexican born about 1830 and who died of typhus in 1895. Here is his 1895 print, Grabado de Calavera Tapatia, “Picture of a Tapatia (Guadalajaran) Calavera” the oldest example I can find. Here is Calavera Tapatia. Image from Wikipedia. Manilla was the first to make prints that humanized and caricatured death using skulls and skeletons. He started the modern representation of the Calavera as a political commentary. Manilla and the later engraver Jose Posada (whose image of “Calavera Catrina” was shown near the start of this article) were associated. They both were political illustrators for the same famous Mexican printer and publisher of that era, Antonio Vanegas Arroyo. Arroyo published the most popular street corridos gazettes of the time. The name of these kind of papers, corridos gazettes, is based on corrido. The corrido is a popular narrative song and poetry form about oppression, history, daily life for peasants, and other socially relevant topics. 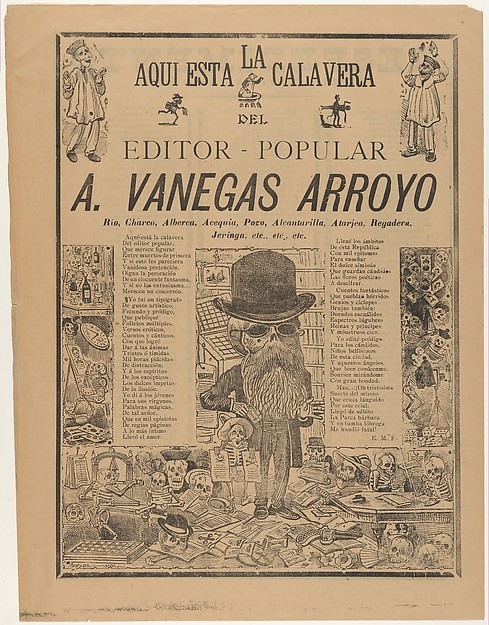 These publications were in the strong revolutionary bent that is a big part of Mexican history, and showed the oppression of the poor by the rich, and made fun of the wealthy, using words and engraved pictures. Jose Guadalupe Posada (1852-1913) was a famous political engraver and illustrator who worked in print as “Father Cobos.” His career as a political illustrator began in 1871. His social criticism showed situations of inequality and injustice in the country and Mexican society at large, and made ​​him famous in folk art. He is known for his engravings of skeletons, calaveras, illustrating stories of politicians, ladies, crime, priests and bullfighters. 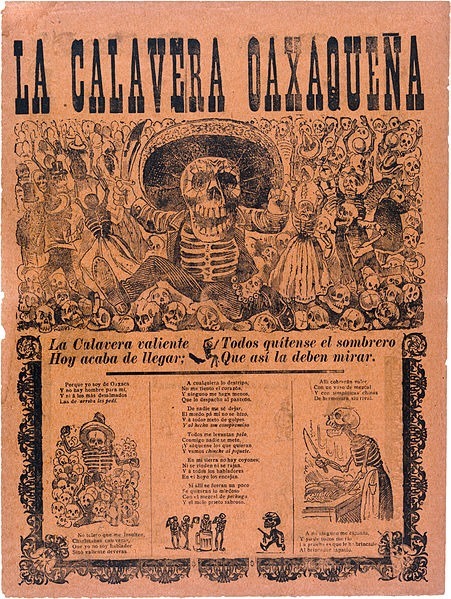 Here a Posada calavera from one of Arroyo’s publications printed in 1903 called La Calavera Oaxaqueña “The Oaxacan skeleton.” Image from Wikipedia. .
Posada even made fun of the Catholic Church in the 1905 print, La Trononte Calavera de las Campanas Modernas, “The thundering skeleton of the modern bells.” Nothing was sacred to these revolutionaries. Image from metmuseum.org. This 1907 Posada print shows the connection between Posada and Arroyo. Image from metmuseum.org. In 1913, Posada published the image that was to become La Catarina, a skeleton wearing a fancy hat but no other clothes, shown below. He called this picture La Calavera Garbancera. 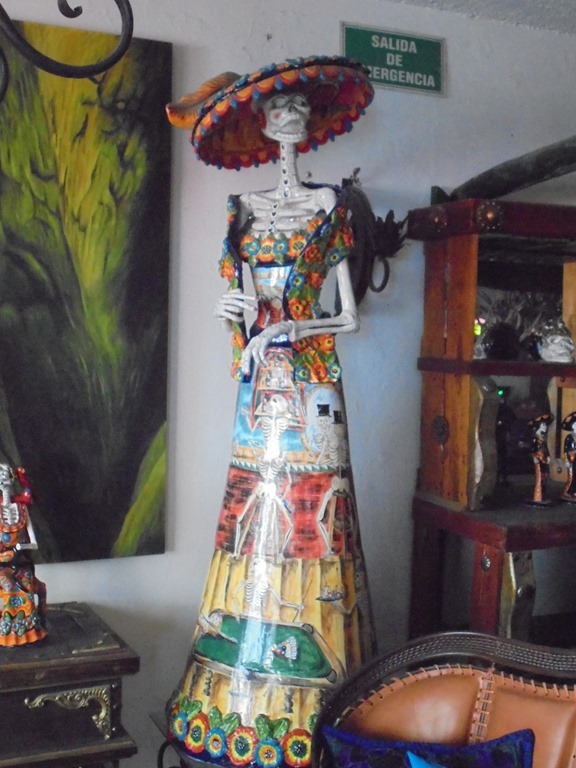 It is the first instance of the skeleton lady wearing the big fancy hat, the image that is to become Catrina. Now it has another name and a different meaning, carrying social commentary. Posada was no stranger to the cultural movements and social classes of Mexico at this time. He had already shown his capacity for critical comment. Now he takes from from their myths and uses the image of the calavera to ridicule the emptiness of the upper classes. In American English there is the expression, “empty suit,” meaning a prominent person regarded as lacking substance or ability. What represents the Mexican upper class empty suit better than the skeleton? A garbancera was a person, whether Indian, mestizo, or mulatto “putting on” (as donning a costume) the clothes and airs of the Europeans. These are lower class people trying to respond economically and symbolically to the cultural crisis of Mexico that had been ongoing since the conquest by Cortes. They were trying to better their position in society by pretending to be something they were not. 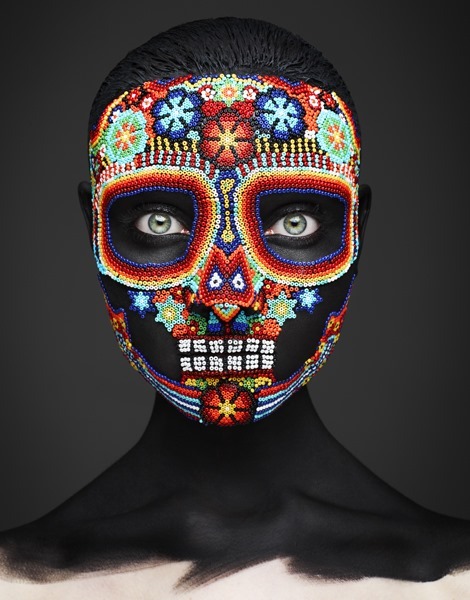 Posada combines the idea the garbancera with the calavera image he had been using for years now, and created this image intended to satirize the upper class ladies striving to be something that they we not, ridiculing their excesses. 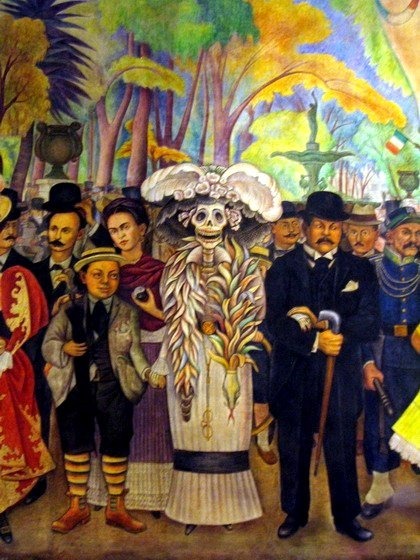 This image did not take the name Catrina until more than 30 years later, in the painting of Diego Rivera. So the image that put me onto the track of Catrina was misnamed. What do you know about that? Here is the image again. Note the caption. Posada died poor and mostly forgotten in 1913 and recognition for his role did not really come until after his death. The largest celebration of Posada and his work was 100 years after his death, in 2013 in Mexico City. Largely forgotten by the end of his life, Posada’s engravings were brought to a wider audience in the 1920s by the French artist Jean Charlot, who encountered them while visiting Diego Rivera. There is a change in the connotation of the image, to the extent that Diego Rivera, a Posada fan, reinvents both the name and the meaning of the etching to remove it from its social and political context, to call it “Catrina” an adjective to name it from the original Garbancera. Catrina now has become a symbol of the Day of the Dead, a happy skeleton enjoying her death, and the original sense of political satire totally changed. Below is a close-up of the Rivera’s painting. Image from Wikipedia. In this painting Diego Rivera reflects admiration for the work of José Guadalupe Posada. Diego drew himself when he was nine; at his side are Frida Kahlo and Catrina; In a black suit with a mustache is José Guadalupe Posada. We are told by friends that now Catrina is such a popular figure that children make Catrinas for display on Day of the Dead. 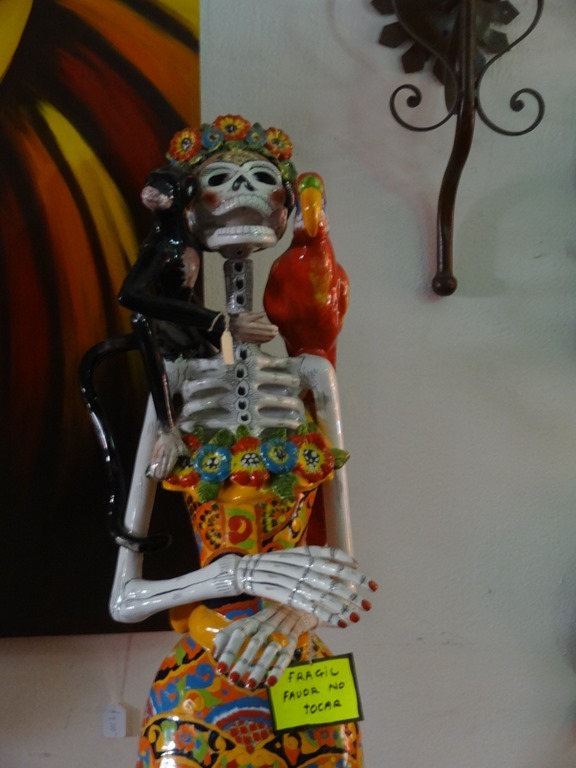 And Catrina is for sale all year long at many nice crafts shops in places like Tonala. I think the meaning has moved from the political satirical one of Posada, and is now the more traditional meaning for a calaca. Calacas are depicted as joyous rather than mournful figures. They are wearing festive clothing, dancing, and playing musical instruments to indicate a happy afterlife. 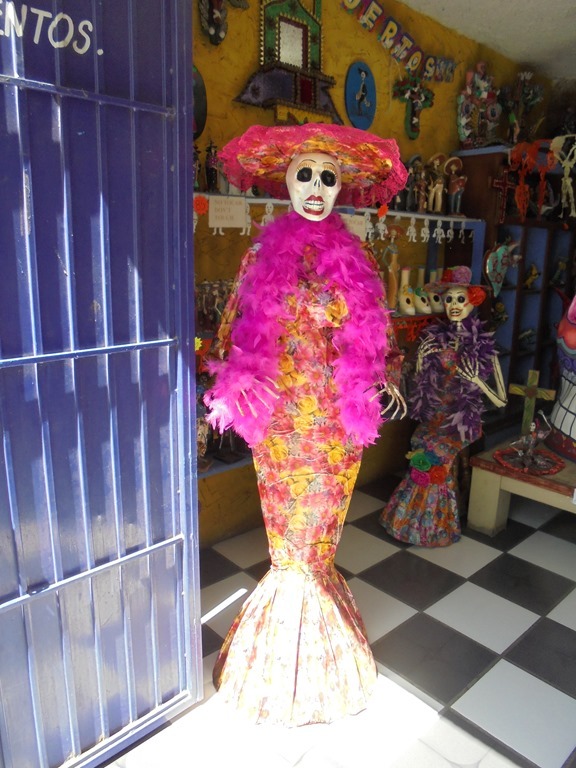 This is what the modern Catrina images seem to show. 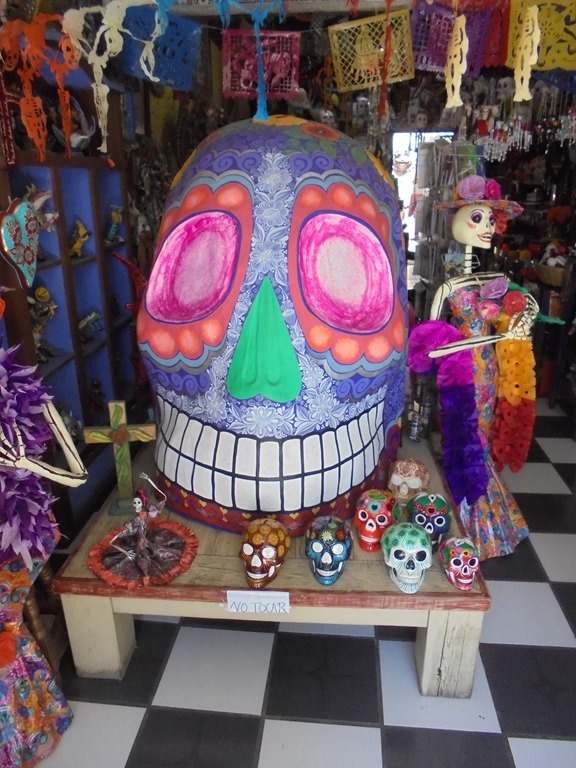 In addition as part of the Day of the Dead celebrations there are painted face Catrina masks and Catrina dresses that are popular women’s garb. Diego Rivera’s Catrina has gone mainstream in Mexico. Here is a particularly fancy such Catrina mask. Image from culturacolectiva.com. “A toditas las catrinas” is the line from the song La Loba Del Mal by Chalino Sánchez. Where the wolf attacked all the Catrinas. Chalino Sánchez was a famous Mexico singer for a few years in the late 1980s to 1992 who was best known for his best known for his narcocorrido recordings. During the period in which he wrote, La Calavera Catrina was in popular culture, so he was certainly aware of it. When he sang about Catrina in the song, he used the earlier meaning, the well dressed garbancera, the pretty young girl dressed up in fancy clothes. Why would he be upset that the wolf chased away the Catrina, unless it was a girl with whom he wanted to greet the dawn? It it were just a skeleton, would he have this sense of romance? My search for Catrina has come a long way, from the skeleton, to the fancy image of Diego Rivera, and now in song, back to the earlier meaning, the Mexican girl dressed up for flirting with the boys. This was a good research example. I read something that I did not understand (“A toditas las catrinas”), and kept it in the back of my mind. 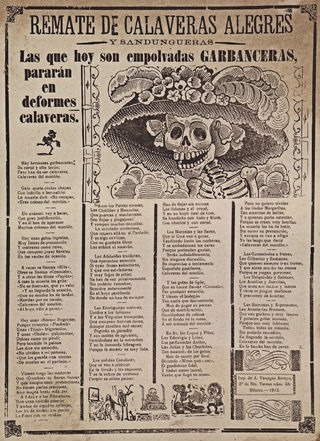 Then while I was learning about something else (Mexican skulls and skeletons for sale in craft shops) I stumbled over some reference that made a connection (The Posada engraving that was actually misnamed “Catrina”). I started searching with Google, looking up Day of the Dead and sugar skulls. These led me deeper, to the calavera, among other things. Searching on Posada took me to where I understood him in context of the Mexican revolutionary movement in which he was a part. This showed me something of Mexican history from the War of Independence to the Revolution. I also saw how one man, Diego Rivera, took an existing image and reworked it, and then made it popular. 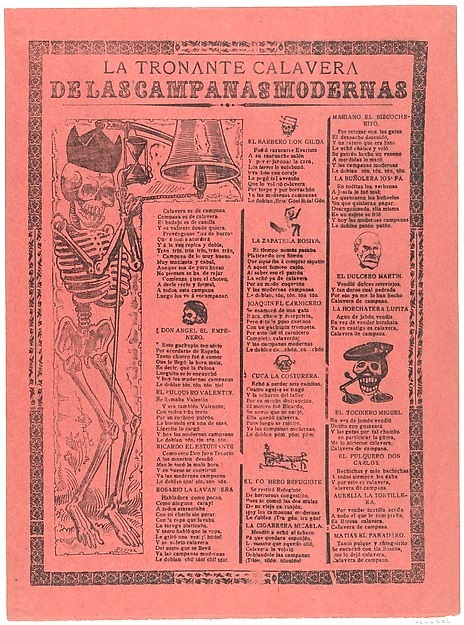 Finally this new image (present day La Catrina) and its popularity swamped the older revolutionary meanings altogether. This entry was posted on July 4, 2015 at 7:30 pm and is filed under Guadalajara, Mexico. You can follow any responses to this entry through the RSS 2.0 feed. You can leave a response, or trackback from your own site. I learned so much here, Richard and Carol. Thank you for all of your careful researching and taking the time to craft such an interesting article. 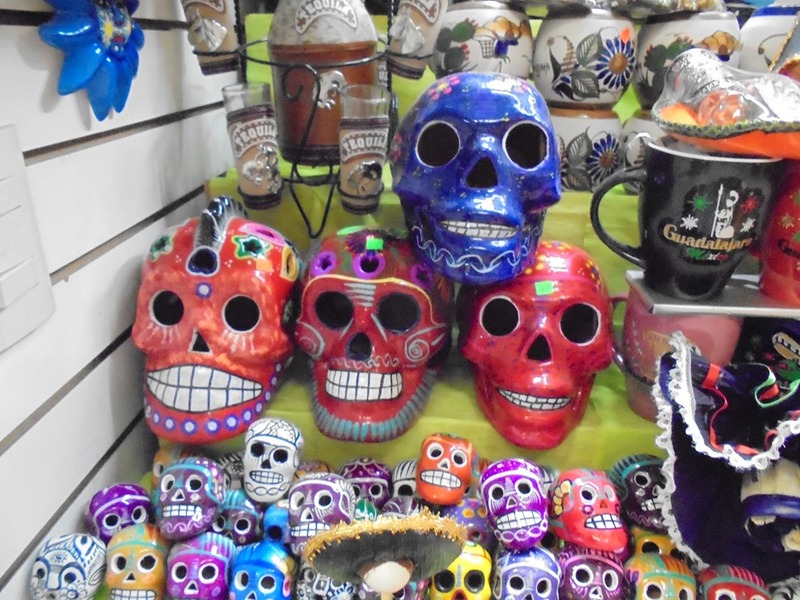 When Sol brought me with him last year (shortly after we met you both in India) to San Antonio on a business trip, the colorful skulls and skeleton figures were everywhere in the shops. I had no idea what it was all about. Now I know!